Tajikistan gained sovereignty nearly 17 years ago. Civil war that lasted five years took over 100,000 lives and made as many women and children widows and orphans. The war devastated national economy, both industry and agriculture. Tajikistan has not recovered yet: unemployment grows, factories idle. The situation being what it is, people are left to their own devices. Thievery and murder, human traffic, frauds, prostitution are booming. Very many are convinced that there is nothing to be done about corruption anymore. Suicide appears the only solution to the problems of many. According to official reports alone, 478 tried to take their lives in Tajikistan in the last two years. Over 100 suicides were logged in the Sogdi region alone in the first five months of 2009. In the meantime, some people retain optimism and refuse to paint it all black. Some people in Tajikistan aspire to revive ancient crafts. The Khamidovs live in Kulangir, a village in the Bobojongaful district. Domullojon Khamidov, 51, the father of four, and his sister Shakhodat Khamidova, 47, the mother of three, decided to resurrect the sabadfobi - weaving of the sabads or baskets. "We learned to weave baskets from our mother Oltuna," Khamidov said, "and she had learned it from our grandmother. I guess it makes the sabadfobi our family craft. I've been a builder for almost 30 years but disintegration of the USSR put an end to mass construction in Tajikistan. We have jobs only whenever our company won a tender. The rest of the time, we are as good as unemployed. Anyway, we here refuse just to sit and do nothing. My children and grandchildren and I... we weave baskets for cakes, for the kurut (balls of dried up sour milk - Ferghana.Ru), clothes, and so on. Besides, we also make the zambar (camel saddlebags), vases, and special baskets for fishers. We even learned to make the avul - a small room where one may live in spring or summer. Its woven walls and ceiling create unique microclimate. When they were shooting a film in the Shurkul natural park in the Shakhristan district last year, we made an avul for them." "Weaving the sabads, we use evergreen shrub," Khamidov continued. "Matter of fact, it is also possible to use Spanish broom, poplar, apple-quince, and pomegranate. Every twig has to be boiled almost four hours before its bark is stripped." "I've been a factory worker for 25 years," Khamidova said. "The pay is barely above 100 somoni (about $25), not enough for a large family. That was why I decided to take up the sabadfobi. This craft sustained our ancestors for ages, you know. Also importantly, we made a promise to our ancestors to keep it up in the family so that it won't be forgotten. We have to pass the sabadfobi to our children or the traditional will be broken... And so I made a trip to Bishkek to learn the art of European weaving from Forgan Sandor of Hungary. The Association NAU from Khujand contacted me on my return. It was with its help that I extensively toured the Aini and Kukhistonimastchokh districts in the northern part of Tajikistan after that." "I toured distant kishlaks or settlements to meet with girls and young women there and teach them what I had learned. I have more than 300 pupils now. They phone me with words of appreciation almost every day. What really counts is that these people will find their own road in life now and find life itself all the more interesting," Khamidova said. 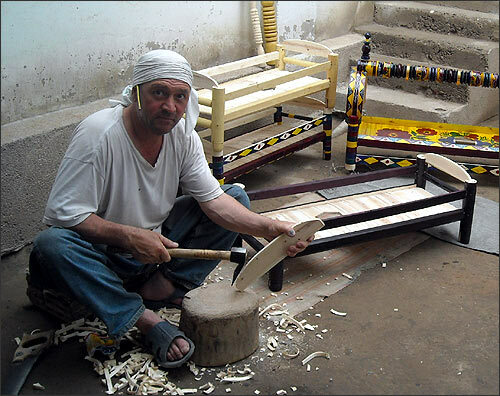 "I was a lad of 13 when I began making cradles," carpenter Abdumannon Ochilov said. "I've been making them for 34 years now. My father, grandfather, and grat-grandfather (on the mother's line of the family) made cradles all their lives. When Khujandatlas, the factory I had worked at, laid us off (they called it vacation, of course, but we knew better), I decided not to seek other jobs. I took up my father's craft instead. We have a family of seven, and all seven are involved. Some of us bring raw materials, others make cradles, somebody else paints them, and yet others sell them. Collective labor or family business, you know. That's what brings bread to our table. 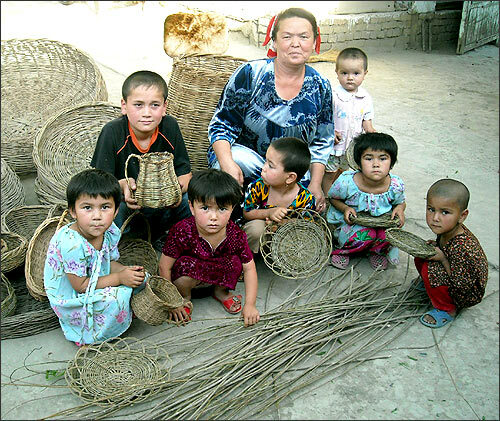 The cradles we make are even bought by citizens of Uzbekistan and Kyrgyzstan. Like our fathers, we are never slipshod in our work. Our customers can count on quality. Sure, we have difficulties too - in procurement of raw materials, and so on, but we never complain and take it all in stride. When the financial crisis is total, people often lack cash. Still, they want what we make, say, to make a gift or something. In a word, sometimes we forfeit our own profit as long as we know that the customer is happy..."
"There are crafts by the hundred in Tajikistan whose development might bring impoverishment down," said Khursheda Sadykova, Director of the Tajik Mission of the Institute of Eurasian Studies. "As the saying goes, craftsmen are nourished by the God. Unfortunately, the crisis under way crashed the purchasing capacity and therefore the demand for lots of crafts including the tanursozi or production of clay ovens known as tandyrs, chests, chimilik (wedding curtains) dastarkhans or tablecloths, patchwork blankets, adras (national cloths resembling silk), zarbofi (golden thread needlework), production of tokiduzi (head caps), pottery, and so on." "Tajik markets and bazaars are full of cheap counterfeits from China and Uzbekistan. Fact is, they make everything. Only the tandyrs are probably genuine. Sure, genuine articles are always in demand, but crisis compels people to buy these fakes because they are cheaper. The state should take over and establish control over this market. It should outlaw import of whatever our craftsmen do with their own hands. When a person makes something with his own hands, he imbues it with his energy and love. That's why these goods should be priced accordingly." "It is necessary to develop tourism and favorable market conditions for our own people," Sadykova continued. "It's great when people revive the disappearing crafts in the days of unemployment, inflation, and impoverishment. After all, these crafts are our history, culture, and way of life." Financial crisis in Tajikistan continues. According to official estimates, almost 60% exist below the poverty line. Promoting the National Strategy of impoverishment curtailment, the state is determined to bring down this figure to 32% in 2015. Two years ago, it would have taken Tajikistan $13 billion (or so Minister of Economic Development and Trade Gulomjona Bobozoda used to say). Still, it was but the domestic socioeconomic crisis alone that Tajikistan was facing two years ago. Independent experts claim that Tajikistan will overcome the crisis under way only with financial help from international institutions. On the other hand, the country can and should rely on its own intellectual potential and natural riches. Emphasis on ancient crafts may replenish national energy and enable lots of people to survive the time of trouble.